A slightly modified version of this article first appeared in the Morning Star on 15 February 2018. This short book by British academic TJ Coles will perhaps not receive as much attention as another recently-released text that shares its name. It is, nonetheless, an important and insightful book, providing an alternative viewpoint on the escalating crisis over Korea, and promoting an urgent message of peace. 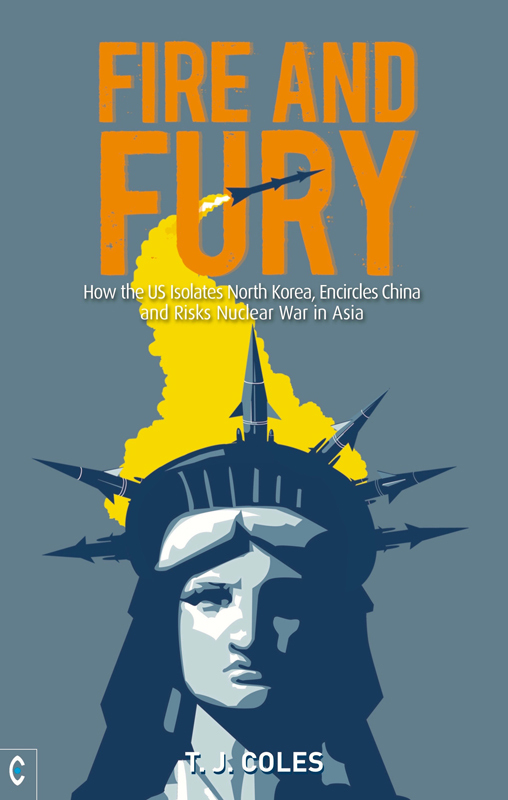 The primary aim of the book is to dismantle the idea that the Democratic People’s Republic of Korea (DPRK) is a serious danger to regional and global stability; that it’s an aggressive nuclear state that deserves to be “met with fire and fury like the world has never seen”, such has been threatened by the president of the United States. The ball is in the US’ court in terms of promoting denuclearisation and de-escalation, as the DPRK has stated many times that it would be willing to end its nuclear programme in exchange for diplomatic recognition by the US, an end to sanctions, and a guarantee against regime change operations. In a world where Iraq, Libya or Yugoslavia can be “taken out” by NATO, such demands are not unreasonable. Coles catalogues the numerous attempts made by the North Korean government to conduct substantive negotiations with the US and South Korea, only to have its efforts frustrated by successive White House regimes. The DPRK has invaded and bombed not a single country, unlike the US, which has invaded and bombed dozens of countries. On top of that, the US maintains a permanent threat of nuclear annihilation, for example using B52 nuclear-enabled bombers in joint military exercises with South Korea. Its deployment of the Terminal High Altitude Area Defence (THAAD) ‘missile defence’ system is highly dangerous and provocative, and is aimed not only (or indeed primarily) at preventing North Korean aggression but at containing and threatening China. The THAAD system, much like Reagan’s ’Star Wars’, seeks to render other countries’ nuclear weapons redundant, thereby expanding possibilities for the US to engage in nuclear blackmail. The take-home message is that we must demand an end to US warmongering and bullying; expose the attempts to paint the DPRK as a threat to regional stability; and support multilateral negotiations towards a lasting peace. The book isn’t without its flaws. Without any real analysis of the subject, Coles writes off the DPRK’s political system as ‘despicable’. The DPRK’s form of socialism is certainly quirky, and its leadership makes mistakes, but it’s important for the western left not to universalise its own idiosyncratic culture and take an arrogant attitude towards those that don’t follow it. The DPRK’s vision of socialism incorporates elements of Korean nationalism and Neo-Confucianism that, while not Marxist, bridge the gap between strongly entrenched traditions and modern socialist ideas. Much the same could be said about Latin American liberation theology and its combination of socialist ideology with Christian teaching. When assessing a political culture, we should be careful to avoid subtly bolstering imperialist cultural hegemony. Another criticism is that the book is not terribly well organised, moving unpredictably from well-sourced and properly-referenced sections to bold, unsubstantiated statements. Defects aside, ‘Fire and Fury’ is an important book that deserves to be read by all those that wish to see peace in the Korean Peninsula. Good books to read alongside it include Selig Harrison’s ‘Korean Endgame: A Strategy for Reunification and US Disengagement’ and Tim Beal’s ‘North Korea: The Struggle Against American Power’.